In 2017, it's impossible to approach a marketing strategy without thinking about the mobile market and its prevalence in the world. According to the Pew Research Center, 95% of Americans now own mobile devices. That's a huge percentage of the American population that you could be targeting with your marketing strategy. But what does it take to start a mobile marketing strategy, and how do you maintain one once you have it? One of the most important first steps that you need to consider when pumping up your mobile marketing strategy is whether your website is mobile friendly and mobile responsive. Mobile friendly and mobile responsive sound similar, but they are actually two different concepts. A mobile friendly website is one that can be viewed on any device, whether it's a laptop, tablet, or smart phone. A mobile friendly website is functional and helpful, even if the content appears smaller and doesn't resize automatically. A mobile responsive website however, is a bit more complicated. It's a website that reorganizes and automatically resizes itself depending on the size of a screen. A responsive website is a website that is extremely flexible, and the buttons, links, images, etc. on the website fit the screen size perfectly. Always make sure that your website is at least mobile friendly, but if you want to ensure that it reaches the maximum number of customers, you also need to make sure you have a website that it is responsive. According to the same research by Pew mentioned earlier, 98% of people look at text messages when they receive one on their phone. That means that text message marketing is a prime location to get the attention of your customers. You can gather phone numbers from customers in the same way that you get email addresses from them: whenever they buy a product from you, online or in store. Use text message marketing to regularly send out coupons and promotional offers exclusively through text messaging. Just make sure you aren't texting them too often. No one likes for their phone to get blown up with hundreds of text messages! Not all businesses need an app, but if you're a service industry, or even retail, sometimes having an app makes it easier for your customers to access the info they need. For example, if you are a software company that helps users manage their company's accounting information, you might get an app developed that allows users to access and edit that information on the go. If you're a retail shop, such as a boutique, you can also have an app developed to make it easier for customers to buy products from your online store. The advantage of apps over mobile friendly websites is that you can send push notifications through apps, letting customers know when you have a big promotion going on. Not only should your websites be mobile friendly, your emails should, too. Most people access their emails on their phones, whether through Gmail, Outlook or another mobile email app. If your emails are not built to be viewed on mobile devices as well as desktop computers, then you'll need to rethink you email marketing strategy to make sure that your emails are mobile friendly. MailChimp, Constant Contact and other email marketing services make it easy to ensure your emails look good on any device. Reviews are vital to the credibility of your business. One of the easiest places for customers to leave reviews for your company is on your Google Business Page through a Google Review. These reviews will show up on your Google Business Page when people search for your company on Google Search or Google Maps. You can also encourage customers to leave reviews for your business on Facebook, Yelp, and more! 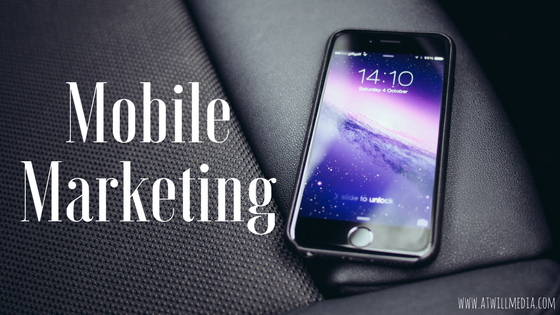 If you haven't yet changed up your marketing strategy to include a mobile marketing plan, now is a good time to start planning for 2018 and beyond. The prominence of mobile devices in marketing will only continue to grow. Jump on this trend now to reach more customers!